Welcome to the family, Danielle! The pile of books on her desk gave it away. At the end of January, our Salt + Light secret service spotted a pile of books about Catholicism on her desk. But she's not Catholic, so it was odd. Two months later, Salt + Light CEO Fr. Thomas Rosica announced that she would be entering full communion with the Catholic Church. Two months after that, she was confirmed as a Catholic -- 23-year-old Danielle Jones! Danielle was already baptized in the United Church when she was a child, so she went straight to Confirmation and First Communion. 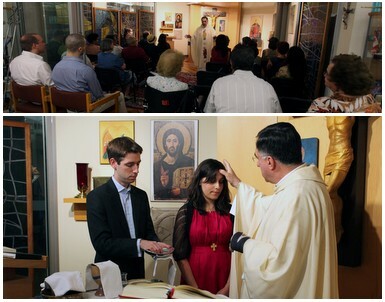 The actual date was this past Sunday, the feast of the Holy Trinity, and the location our Salt + Light chapel. Fr. Rosica received Danielle into the Church and celebrated the Sacrament of Confirmation and Holy Eucharist with her and a host of friends. Danielle, what was your faith background before becoming a Catholic? My dad's side is strictly from the United Church, but my mom's side has a mix of Anglicans and Evangelicals. However, there are a few Catholics on my mom's side. It was my mom's side that showed up on Sunday, about 15 to 17 of them. It's funny 'cause my great-grandmother is Catholic. So all my aunts and uncles said, "Granny won!" How did you decide to learn more about Catholicism? At Salt + Light, I am surrounded by Catholicism. So I became more and more curious about it. I started attending Mass at Holy Cross chapel (the Salt + Light chapel) with Fr. Tom. I guess I was being drawn more and more towards the Catholic faith for the past 2 ½ years, but I didn't realize it until Fr. Tom invited me to think about it last December. Was there a specific Salt + Light program that got you interested in the Catholic faith? Well, there wasn't one specific program that got me interested. But there was one program that helped me make that decision -- Lectio Divina with Archbishop Thomas Collins. I was editing that program the week of January 11th. Archbishop Collins was talking about the parable of the wedding feast. He said that you don't know what will happen until you accept the invitation. Like accepting the call of God to be a Christian and so forth. That program, along with the liturgical readings of that week, spurred me along. I decided to make my journey towards becoming a Catholic official. I told Fr. Tom about it the end of that week. It was Friday, January 15th. Regarding my RCIA program -- it happened "in-house", you could say. I've been learning about the Catholic faith working at Salt + Light. I've been able to engage in conversations on faith and philosophy with the many people here who've studied theology. I directed all my questions to my peers and to Fr. Tom (for the official teaching). The many books I've been given are incredible. I highly recommend Christ Among Us: A modern presentation of the Catholic faith for Adults by Anthony Wilhelm! What was the experience of being confirmed like for you? It was beautiful and fulfilling and emotional. After the ceremony, when I came home, I was so happy that I started bouncing off the walls! It was so ridiculous! As if I were 12 again, singing and dancing to silly songs! You don't really think about the emotions that pass through you, but that's how I was. I really felt like I was coming home, that I'd been a Catholic for years and years. So, it's been a beautiful experience so far. At the end of January, our Salt + Light secret service spotted a pile of books on Catholicism on her desk. But she's not Catholic, so it was odd. At Salt + Light, I am surrounded by Catholicism. So I became more and more curious about it. I started attending Mass at Holy Cross chapel (the Salt + Light chapel) with Fr. Tom. I guess I was being drawn more and more towards the Catholic faith for the past 2 ½ years, but I didn't realize it until Fr. Tom inivited me to think about it last December. It was beautiful and fulfilling and emotional. After the ceremony, when I came home, I was so happy that I started bouncing off the walls! It was so ridiculous. as if I were 12 again, singing and dancing to silly songs. You don't really think about the emotions that pass through you, but that's how I was. I really felt like I was coming home, that I'd been a Catholic for years and years. So, it's been a beautiful experience so far.